Embed up to 2 channels of audio from balanced analog, optical or HiFi RCA, or embed up to or 4 channels of AES/EBU digital audio into any SD, HD, Ultra HD or DCI 4K SDI video connection. 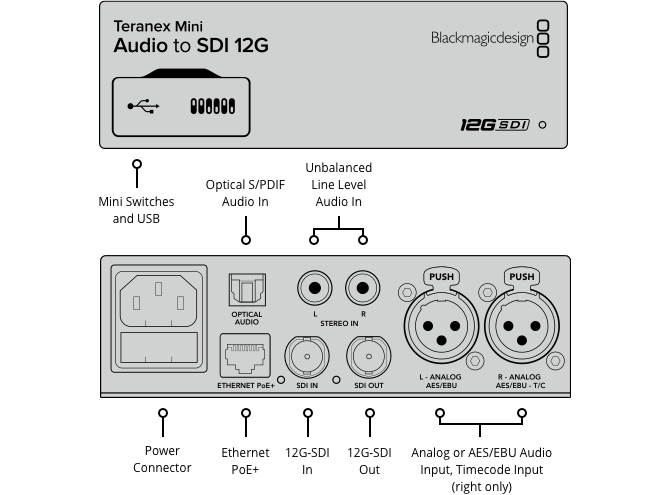 Take audio from devices such as audio mixers, iPods and analog decks and embed it into SDI video connections for use with SDI routers and decks. 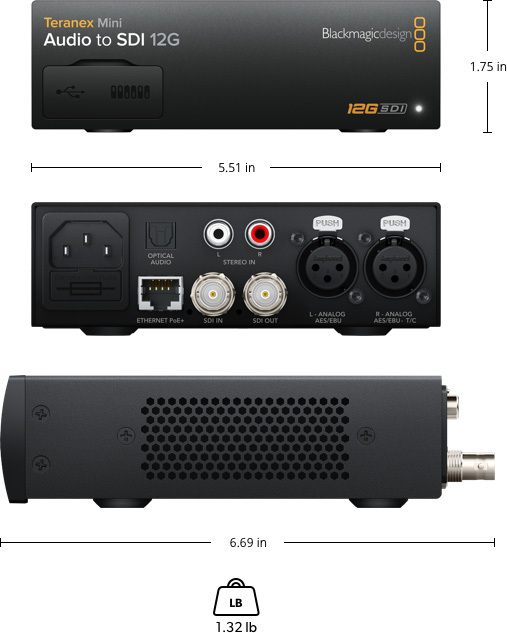 4 channels professional 110Î© balanced digital audio via XLR connectors. Right XLR can be configured for timecode input. 525/29.97 NTSC, 525/23.98 NTSC,625/25 PAL. 2048 x 1080p23.98, 2048 x 1080p24,2048 x 1080p25, 2048 x 1080PsF23.98,2048 x 1080PsF24, 2048 x 1080PsF25. SDI video connections are auto switching between standard definition SDI, high definition level B 3G-SDI, 6G-SDI and 12G-SDI. Mac OS Xâ„¢ and Windowsâ„¢ software upgrade via USB and Ethernet.